Episode Capsule last revised on 08 Oct 2018. Oh thank God, I'm back in modern Japan again! Hey Kagome, do you think our roles were switched? You're right! Our roles were switched! How are we going to do the preview now? Oh well… let's continue with this then! Next on Inuyasha, "Gap Between the Ages". Remember to watch it! I've an exciting performance in the next episode, so don't miss it! Finally…! Our roles are back to normal! Kagome's classmate. Keeps interrogating Kagome about her delinquent boyfriend. You’re just not fit enough. Kagome’s world is pretty dangerous too. It is rather strange that she should say this, as the first time that Kagome met Inuyasha, he was pinned on a tree, fast asleep too. 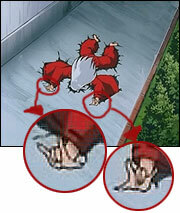 When Inuyasha was 'Osuwari-ed' by Kagome, his hands made a 'I Love You' handsign. Daytime in modern Japan. Various flashbacks in modern era are shown. Cut to flashback from previous episode, the fight between NAR and SES. KAG: (narrating) Naraku lured him to his castle. Just when Naraku was about to trap Sesshomaru in his body, Inuyasha broke through Naraku's barrier and invaded his castle. Cut to INU throwing another wind scar at NAR, which slashes his body and frees SES. Cut to SES throwing an aura at NAR with Tokijin. Cut to NAR, enveloped in a miasma, flying high up. SES starts to morph into his full-demon form. SES:	(furious) Fool!!! Do you think you can run away from me? Cut to KOH about to attack Rin, when SES appears behind him. KAG: (narrating) Naraku escaped because he had made use of Kohaku. Cut to NAR's miasma dissipating. Daytime, cloudy. INU-gang stand in the courtyard, in the aftermath of the battle. INU: (angry) Despicable Naraku…! Is he not coming back to his castle?! MIR: Seems like it. After Inuyasha cut through the barrier, the castle is useless to him now. INU: (grinding teeth and clenching fists) Damn! Given another chance, Naraku would have died in my hands! I was so close!! DAMN! Daytime in KAG's classroom. It is math class. Teacher: (stops writing on the chalkboard) This equation will be on the test the day after, so remember it. KAG: (panics, with pale face) T-Test?! School's out. KAG is packing her bag in the classroom. KAG: I have no time to worry about others. I have to catch up in two days. I really don't want a retest. Eri, Yuka and Ayumi, carrying their bags, appear behind KAG. Eri: Kagome, can you go yet? KAG and friends stand in front of a shop. KAG: (hands in begging gesture) That's why… So can I borrow your notes, please? Yuka: We need revision too. KAG: Pretty please… (smiles) I just need it for a moment. KAG: Yeah… That's right, I just need to get them photocopied. Eri, Yuki & Ayumi: Time to eat! The table is filled with burgers. KAG, holding her purse tightly, is tearing. Cut to her friends eating happily. KAG takes a sip of her drink and sighs. Yuka: Kagome. You're thinking about it again. Eri: What do you mean what? That mean and jealous boyfriend of yours. KAG: (waves her hand uncomfortably) No, I'm not! I'm thinking about something else. KAG: (takes a burger) What do you mean? KAG: I met his brother the last time round. Eri: Is he a bully too? Ayumi: Is he strong too? KAG: Well, his brother is stronger it seems. Those two always fight when they meet. Eri: (thinking, worried) Is she going to carry on like that? Ayumi: (thinking, hopeful) I believe love will conquer all… Go for it, Kagome! KAG: (notices the looks) What's wrong? KAG: Can I borrow your notes now? At a convenience store. KAG and friends walk in. KAG holds a notebook in her arms happily. The group gasps as the shop is filled with people queuing up to use the photocopier. Eri: All of them have the same objective as Kagome. Yuka: What should we do? Line up? Cut to a 'Malfunction' sign [故障中] on a photocopier. Cut to demolished empty land. KAG: (shocked) Can't be! (tearing, backing away) What's going on…? KAG's friends are walking away from her. KAG: Goodness… (shouts) What are friends for?!! Evening in the Feudal era. SHI peeps into the Dry Well. INU slams his foot on the well angrily. SHI looks at him. INU: (impatiently) What's taking Kagome so long?! Didn't she say she'll be right back?! SHI: She said she'd be staying there for about 2 to 3 days. MIR: (walks to INU with SAN) Be patient, Inuyasha. INU: How could you guys be so patient about it? SAN: It's not the first time that Naraku has escaped. So Inuyasha… I think you should rest well now. INU: What are you saying, Sango? Compared to you guys, I'm not tired at all. MIR: (points a finger at INU) That's right! We won't last long if we had fought like you. INU: You're just weak. Weak. KIK walks in a forest. A Soul-Catcher flies towards her and lands on her finger. KIK: I see. Naraku's aura is still around… (looks at the Soul-Catchers flying away, thinking) I've sent the Soul Collectors to look for him too… And yet, I can't locate his barrier… All his evil energy… Where is it now? Cut to KAR and KOH on her feather in the sky. An image of NAR momentarily flashes across the screen. Cut to flashback from previous episode, when KOH raised his sickle-chain to kill Rin. Cut to SES grabbing KOH by the neck. KOH is expressionless. SES drops KOH. Cut to present. Nighttime. SAN and KIR sit on a knoll overlooking KAE's village. 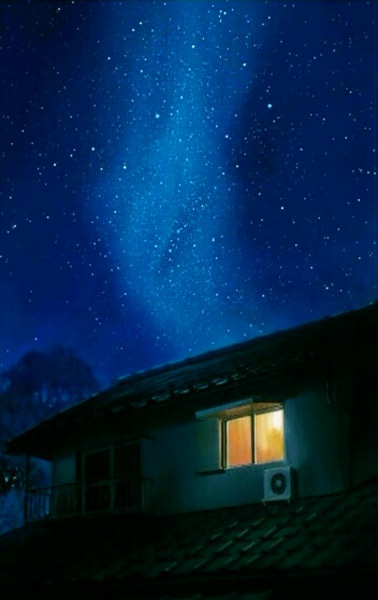 SAN: (thinking) Naraku disappeared… Kohaku too… (looks down, says to herself) Kohaku… Where are you…? MIR walks up from behind. KIR meows. SAN turns around. SAN and MIR look at each other. KAE, SHI and INU are in KAE's hut. They are eating. KAE: Oh… That priest went to cheer Sango up. SHI: Yeah, it must be. Kagome said that Sango is hoping her brother would return soon. Back with SAN, MIR and KIR. KIR runs to the other side of SAN, so that MIR can sit next to SAN. MIR: You're still worried about your brother? KIR looks at SAN affectionately and meows. MIR: (takes his staff and stands) I guess you want to be alone now. SAN: (surprised) That's… That's all? SAN: Oh… I thought you were pretending to cheer me up and do something perverted. SAN blushes and a huge sweat-drop appears on her forehead. Cut to night sky. A loud slap is heard, as well as MIR's wince. A shooting star slithers across the sky. Cut to KAE's hut. KAE and SHI look up. INU is squatting over the well, shaking his leg impatiently. INU: Damn… how lazy can she get! Night time in KAG's house. She studying in her room. She stares at her notebook, and nervously looks at her textbook. KAG: (exasperated) I haven't a clue!! Cut to KAG walking in the corridor with her math textbook. Cut to image of a clock. It is 7:46pm. It fades to show 10:30pm. KAG: (happy) Oh okay…! Yes, yes…! See you! Sota, who is watching TV in the same room, yawns. KAG puts down the phone. Cut to KAG walking out of the room, eating a snack contentedly. KAG: (thinking) I didn't get to do anything yesterday. KAG: (spins around, stern) Don't talk to me! I might forget what I memorized! (clenches her fist in determined manner) I'll have to catch up today! KAG slides open the door to the living room. GRA and INU (who is playing with Buyo) sit inside. KAG crashes to the ground. KAG: (slams her hands on the table) Why?? INU: I came to see what's taking you so long… Come on, we're going back. KAG: (yells fiercely) What are you talking about?! Tomorrow's the test!! INU: Why are you angry again? Sota: (runs off) See you guys! KAG: (to INU) Don't go out no matter what. Be patient and wait inside the house. INU makes a face at KAG and walks in. Mama: (holding a lunchbox in her hand) Where's Kagome? Mama: Oh dear… Kagome forgot her lunch. Mama: I wonder if you can deliver it for me? INU looks at the lunchbox. In the streets. Pedestrians are giving weird looks. Cut to INU, wearing a cap, on all fours, sniffing the ground. INU: Keh! I can catch up once I get Kagome's scent. Policeman: (background) Catch him! Someone!! Out of a corner of the street, a suspicious looking man with shades and a bag under his arm runs out, knocking over a trashcan. A policeman chases him. The policeman steps on a banana peel, fallen out of the trashcan, and falls. Thief: (to pedestrians) Get lost!! The pedestrians shriek and move aside. The thief, running forward, sees INU. INU stands up coolly and face him. INU blows his fist and slugs the thief in the nose. The thief winces and falls over. INU: Kagome's world is pretty dangerous too. Cut to a fire engine moving in the streets, its alarm sounding. INU is leaping among the buildings. Cut to a burning apartment. A little girl, hugging a teddy bear, is crying helplessly. INU lands on top of the building facing the burning apartment. The fire ladder is moving towards the window of the apartment. Battle music plays. INU leaps off the building, springs off a police car and dashes up the fire ladder. He reaches the fireman who are putting out the fire from the top of the ladder. INU does a 'Iron-Reaver, Soul-Stealer' on the window and bursts into the apartment. He lands heroically in slow-motion and the little girl looks at him in awe. INU: (grabs the girl) What are you waiting for?! INU leaps out of the window with the girl in his arms. A split second later, the apartment explodes. As INU is landing, his cap is blown off by the wind. The girl looks at INU and gasps. The girl smiles ecstatically as she observes INU's fluffy years. INU lands and lets go of her. Girl: (pulls INU's ear) It's an ear! Girl: (runs forward, shouting) Thank you, brother! INU: What a dangerous world! In KAG's classroom. It is math class. KAG sighs and looks out of the window. She gasps in horror as she sees INU perching outside the window and looking in. Eri: (notices KAG's petrified face) What's wrong, Kagome? KAG: N-Nothing… (fake smile, turns around, thinking) What's Inuyasha doing here?! KAG turns to look at the window again. INU is scratching his head with his leg like a dog. One of her classmates notices her. KAG turns back immediately. He turns to see what KAG was looking at. KAG panics. INU falls off the window ledge and crashes to the ground. KAG heaves a sigh of relief. Her math teacher walks up to her. Teacher: Sit? Will you please stand, Higurashi? The class laughs. Cut to INU on the ground. INU and KAG are on the rooftop of the school. KAG: Why?! Didn't I tell you to stay home? INU: (takes out the lunchbox) Here. KAG: My lunch… (thinking) He came to deliver this… (to INU) Inuyasha, wait… Let's eat together. KAG opens her lunchbox. Half the food is gone. INU looks at her guiltily. School's out. KAG is walking in the corridor in a resolute manner. KAG: (thinking) I won't be able to concentrate at home… I'll stay in the library instead. In the library. KAG plonks a stack of books on a table. Cut to KAG's writing and studying. KAG: (determined, thinking) I have to study hard! Hojo: Are you better now? Hojo: You should work out more. Hojo: (gives KAG a folder, [獻立表] Here's some medicinal recipes I've compiled… Try it. KAG dashes out of the corridor. KAG runs down the stairs and into the locker room. Hojo isn't there. Cut to Hojo at the bicycle shed. He is unlocking his bike. KAG runs to him. KAG: (taken aback) T-Thank you. Hojo: Higurashi, remember to stay healthy… Stay happy and eat your three meals daily! Sota: (runs out,excited) Sister, come quick! KAG and Sota walks to the living room. The news is being shown on the TV. The thief that INU stopped today is shown being apprehended by the police and taken to a police car. Newscaster: And so, the boy in red clothing stopped the bank robber. Cut to the entire family and INU watching the T.V. attentively. Newscaster: (standing in front of the burning apartment block) Furthermore, the boy also saved a little gal who was trapped in a fire. Sota: Brother is so cool! Cut to T.V. An image of a kid's drawing of a maniacal-looking INU with huge ears is shown. Cut to family. Everybody gasps. Cut to T.V. The girl that INU saved just now puts down her drawing. She is wearing INU's cap. INU: (exclaims, moves closer to the TV) Hey, that's my cap! Mama: (moves closer to the TV) Yeah, really…! KAG: What have you done on the way to school? INU: (scrutinizes the TV, curious) Besides what's this box? Night time. KAG is in her room practicing her math. A stack of Math, Science and Japanese textbooks are on her table, with 'Post-it' notes sticking out. Cut to INU popping out and staring at KAG. KAG ignores him. He squats. KAG's face twitches. INU pops out on the other side of KAG and stares at her. His ears twitches. He then pops out from behind KAG, looking at what she's writing. KAG: All these busy time. INU continues popping in and out. Sota: (opens the door) What, sister? KAG: Can you keep Inuyasha busy? Sota: (holding INU's hand, walks out of KAG's room) Okay. Brother, let's take a bath together. KAG's face changes. INU bursts into the room, naked and furious, holding TET in one hand and his Fire Rat Robe in the other. He is covered with shower foam. INU: (looking at Sota) What was that?!! Sota: (runs in naked, grabs INU's arm) Now you need to rinse off the bubbles! KAG: (throws a clock at INU's head) Get out! INU winces and Sota grimaces. KAG throws a lamp at INU and Sota cowers. She then throws a barrage of books. KAG: (holding up her trash bin, furious) GET OUT!! INU: Hey! (KAG throws the bin, INU is paralyzed) Ka…GO…ME…! The bin rolls to the ground. Cut to living room. GRA is reading the newspaper. Sota is in his pajamas and is drying INU's hair with a blow dryer. INU seems to be enjoying it. Mama walks into the room. Mama: Do you want to eat dinner? Mama: (walks into the room holding a bowl) I think the curry is too spicy for him. INU whimpers and makes some sounds with his tongue. A while later. It is late at night. INU is seated on KAG's bed, watching her back as she is studying. He looks serious. KAG pauses and turns to INU. INU: What? I'm not making any noise. KAG: (thinking) I'll get distracted with you watching like that… (to INU) Why don't you lie down? INU: Don't be silly. You better study hard! We are returning tomorrow. KAG: (turns around and grimaces) Okay. (thinking) Is he really going to watch me the whole night? I really don't get it… Why is he always so energetic? A while later. KAG turns around to find KAG sleeping on her bed. KAG stands and clenches her fists in frustration. INU continues sleeping sweetly. KAG pause and smiles. Cut to exterior view of the house. Pan upwards to the starry night sky. Daytime in KAG's class. It is math test. KAG yawns as she is taking the test. The rest of her classmates write furiously. She then closes her eyes and nods off to sleep. At the Dry Well in Feudal era. SHI is perched over the well, excited. INU, carrying KAG's haversack, climbs out of the well. MIR: Oh… You stayed over? KAG climbs out of the well listlessly. KAG: (slurring) I had nowhere to rest when you were sleeping on my bed last night! And the test was bad… (tearing, yells) How irritating! KAG's voice echoes throughout the forest. Pans upwards to the sunny sky. Okay, question time! The Shikon Jewel isn't with Naraku now, so who do you think has it? Time's up! Koga of the Wolf-demon Tribe has two in his legs, too! What if Koga was captured by Naraku, too? Is that so?! Then what's this?! Next on Inuyasha, "Female Wolf Demon and the Lunar Rainbow Promise". Did you say female wolf demon? Don't forget about Koga! Compiled on 21 Feb 2008. Last revised on 08 Oct 2018.